Diwali 2017 is just around the corner, only 158 days to go! The event of the year for people in India and the Indian communities around the world! The word "Diwali" is a contraction of "Deepavali", originating from the Sanskrit word Dīpāvalī (दीपावली) which can be translated to "Row of Lights". Hence the Diwali Festival is also called the "Festival of Lights". Diwali is the name for the festival in North-India. In South-India the festival is called "Deepavali". Diwali celebrates the victory of the Good over the Evil and Light over Darkness. It has a major religious significance for Hindus, Sikhs and Jains alike - not only in India, but also for Indians living abroad. In the western (gregorian) calendar, Diwali falls on a day in October or November every year - just after the monsoon season in India. The exact date varies and is being calculated based on the Hindu Luni-Solar calendar (according to the positions of the Sun and the Moon). The day of Diwali falls on Ashvina Amavasya (the lunar day of new moon) on 15 Ashvin (Hindu month). This date also marks the beginning of the Hindu New Year, and many businesses in India starting a new accounting year on the Diwali holiday. Diwali is a festival over 5 days. On the first day (Dhanteras) people pray to Goddess Laxmi for prosperity and wealth. The second day (Choti Diwali) is also known as 'Small Diwali', 'Naraka Chaturdashi' or 'Kali Chaudas' in some states. According to the legend, Lord Kirshna killed the evil daemon Narakasura on this day. People worship Goddess Lakshmi and Lord Rama. The third day is the actual day of Diwali. Many devotees visit their Temples for worshipping Lakshmi, Goddess of beauty, wealth and wisdom with Laxmi Poojas and also pray to Ganesh, the 'Lord of Beginnings' and 'Remover of Obstacles'. When Aarti is performed, oil lamps with a cotton wick are placed on a Puja Thali and offered to the deities, praising the deity by singing wonderful Aarti songs. At night people light up little oil lamps called Diyas, Dipa Lights or Ghee Lamps and place them around their houses. 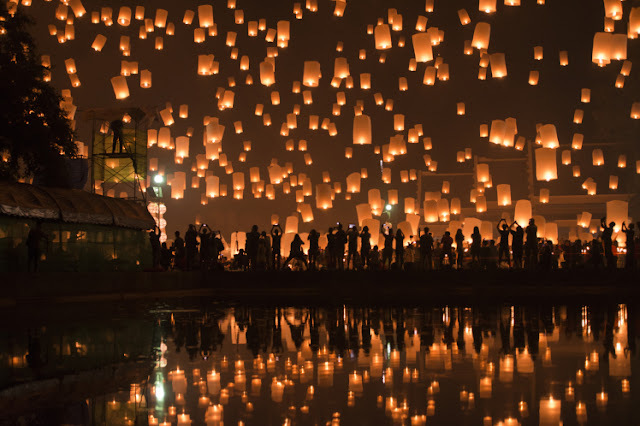 They hang colorful lanterns and fairy lights, enjoying firework displays or blasting firecrackers. The forth day (Padwa) is 1 Kartika in the Hindu calendar and is also known as Govardhan Puja or Annakoot. It is said that Krishna defeated the god of rain and the heavens Indra on that day. He lifted Mount Govardhana to save people's life from the floods. On this day people cook mountains of food resembling Mount Govardhana. According to another legend followed in South-India, Vishnu defeated the demon-king Bali on this day. Finally the fifths and last day of Diwali is called 'Bhaiduj' ('Bhai Dooj') also known as 'Yama Dwitiya'. This is the day for brothers and sisters to strengthen their relationships. Just like Yami prayed for her brother Yama (God of Death), sisters are praying for their brother's well-being on this day, and brothers give little gifts to their sisters in return. All families gather and eat lots of foods and sweets. It is also common to send Diwali greeting cards to family members, relatives and friends. Recently however it is becoming more popular to send eCards or Diwali SMS. Mela (Fairs) take place not only in India, but in many countries in the world. Sellers of handicraft and artworks like to rent a booth on a Mela to offer their items for sale to the general public. The different locations and venues for this event can range from small community halls to the size of a whole stadium like in the case of the Diwali Mela 2017 in Dallas, Texas, USA in the Cotton Bowl Stadium (Date: Saturday, November 2nd, 2013/Time: 4pm to Midnight) with approx. 100,000 attendees. Where is Diwali being celebrated ? Deepavali and Diwali celebrations take place in many countries in the world. There is a large population of over 30 million Indians living outside of India in overseas countries due to migration or as guest workers and students. Those 'Non-Resident Indians' (NRI) and 'Persons of Indian Origin' (PIO) play an important role in many societies and enriching the cultural diversity of whole nations. The largest groups of non-resident Indians live in the USA, Canada, Nepal, Burma, Malaysia, Singapore, United Arab Emirates (UAE), Saudi-Arabia, South-Africa and in the United Kingdom (UK). Depending on the origin of the majority of Indians, the festival in those countries is either Diwali (most immigrants from North-India, i.e. USA/Canada/UK) or Deepavali (most immigrants from South-India such as Tamils, i.e. Malaysia/Singapore). Make the Diwali Festival of Lights a very special one - not only for your family, but also for yourself. The "Festival of Sweets, Gifts, Fireworks and Firecrackers" will be very soon, so why not starting early and planning secretly ahead of the festivities for the greatest celebration of the year? Preparing early avoids the stress during holiday season. Maybe you could already think of the most suitable Diwali gifts for your family members - for your children, your husband or wife, your parents, sisters, brothers, friends and neighbours. Who are you going to invite? What would your guests and family like the most? A new Sari for your wife or mother? Maybe some beautiful cushions or a wall hanger? A certain toy for your kids? Silver figurines or artworks for your parents or best friends ? Have you also thought of what you could be doing? Any plans yet? When is Diwali 2017 ?